Turn a regular day out into a full-blown adventure! South Devon is a great region to visit and there’s no better way to explore than by solving the sneaky clues on a self-guided Treasure Trail; the fun and imaginative way to discover South Devon's towns and villages all whilst solving a mystery! Family excursions don’t have to be over-crowded, stressful and eye-wateringly expensive. Treasure Trails may just have the perfect solution to help re-discover the lost magic of an old-fashioned family day out – without a ride queue, mobile device or overdraft in sight. So, What is a Treasure Trail? It's a real-life adventure that fires up the imagination and gets you exploring the most interesting parts of Devon. Our self-guided Treasure Trails are a captivating challenge that combines mind-twisting clues and fascinating stories for anyone with a sense of adventure. The answers to the clues can be found on permanent historical and quirky features so you'll be exploring and learning about the area at the same time. All of our Devon Treasure Trails are self-guided, which gives you the flexibilty to enjoy your Trail adventure on any day of the week and at a time to suit you. 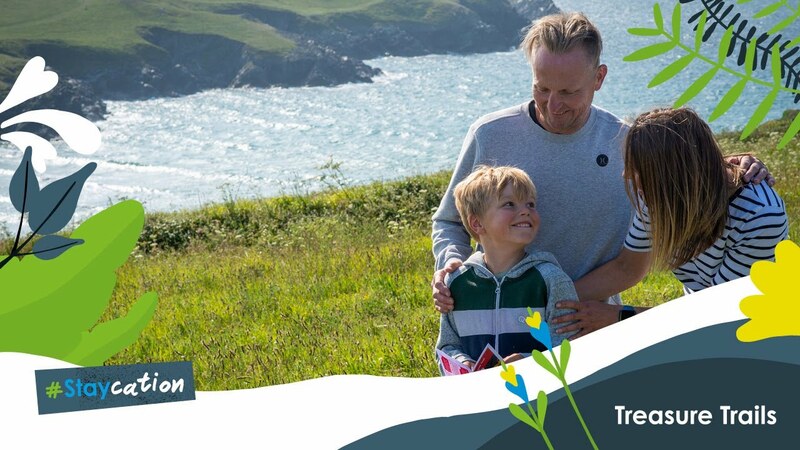 Allow yourself around 2 hours to complete a Devon Treasure Trail and you - and any grumpy kids - won’t even realise you have walked a couple of miles as you will be too busy having fun hunting for the answers to the clues! When it comes to writing treasure hunts around different towns and villages across Devon, it's safe to say that we're a little obesssed! There are 48 Treasure Trail locations across Devon to choose from, covering both countyside and coast, and hundreds more for the rest of the UK. From catching crooks to tracking down sneaky spies and hidden treasure – our Trails are highly addictive (even for parents!) and will turn you into an instant superhero for planning the best day EVER. How do I Get a Trail Booklet? Your Trail adventure can either be downloaded direct from the website and printed or sent in the post; personalised versions are also available online which can include your own photographs and text. Our Devon Treasure Trails won't break the bank. Priced at £6.99 (for the pdf download & print version) a Treasure Trail is a great value and enjoyable way to explore different parts of Devon. One trail booklet can be shared between 4-5 people so you will have a bit left over to treat yourself to a Devonshire Cream Tea after completing your 1st Devon Treasure Trail adventure. Now that's what I can a great day out! Don those pirate hats to solve a Treasure Hunt themed Trail, go undercover on a Spy Mission themed Trail or become a detective for the day on a Murder Mystery themed Trail. Visit the Treasure Trails website for more information. We're proud to share with you our Customer Reviews - they're the real deal. 95% of our customers have rated their Treasure Trails expereince 5 stars! Now that's something that makes us smile. Since we started Treasure Trails back in 2005 over 2 million people have enjoyed a Treasure Trails adventure and we've written over 1,200 self-guided Trails across the UK. If you've got a sense of adventure and want to discover the hidden gems that Devon has to offer, then pop over to the Treasure Trails website and search for your perfect Trail location. Trails can either be purchased online, downloaded and printed, or posted out. Visit the Treasure Trails website for full details. One Trail is suitable for a group of 4-5 people. * The self-guided trails can be completed at any time of day, all year round. Trails are available to purchase online 24 hours a days from the website and can either be instantly download for home printing or sent in the post within 2 working days.